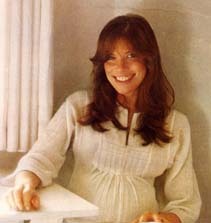 Born into the wealthy New York family that co-founded the Simon & Schuster publishing empire, Carly Simon developed her interest in performing as a young child, both she and her two sisters having been given ample encouragement from their parents to express themselves creatively. All three girls sang together at first, but as the oldest sister Joanna moved on to become a professional opera mezzo-soprano, Carly and Lucy formed the folk duo The Simon Sisters and eventually landed a contract with Kapp Records in 1963. The next year their first single Winkin', Blinkin' And Nod made a minor chart impact. Lucy subsequently dropped out of the duo to get married, and Carly -- under the 'guiding hand' of Bob Dylan's manager Albert Grossman -- continued on with an attempt at a solo album; although recording was completed and a deal with Columbia was in place, the project never materialized. A period spent basking in secretarial work occupied the next year. In 1968 Simon worked briefly as the lead singer for Elephant's Memory, a band that subsequently earned their fame as backing for John Lennon and Yoko Ono. A contract with Elektra in 1970 finally put her solo career back on track, and her self-titled debut reared its head in 1971; the album received a warm reception from most quarters, with the anti-marriage single That's the Way I've Always Heard It Should Be even finding its way into the top ten. The follow-up Anticipation was released later the same year, giving her two more charting singles in the form of the title track and Legend in Your Own Time. 1972's No Secrets and 1974's Hotcakes both maintained her popularity, and in the space between the two Simon married singer/songwriter James Taylor and started a family. By the arrival of Playing Possum in 1975, however, interest in the singer began to decline; it wouldn't be until her recording Nobody Does It Better for the James Bond flick The Spy Who Loved Me in '77 that her career once again took an upswing, continued with Boys In The Trees in 1978. A switch to Warner Brothers was made in 1980 after her final release on Elektra, Spy (1979), failed to generate much attention. Occasional peaks took place during the 80s, but on the whole her best years in music seemed to be behind her. A collection of standards entitled Torch (1981) received a slow-burn kind of popularity, while the ballad and the subsequent album Coming Around Again -- written for the Mike Nichols film Heartburn (1986) -- made a reasonable impact on the charts. By this time a jump from Warner to Arista had been made (with a sole album for Epic surfacing in between). In 1987 another song (Let The River Run) written for another Mike Nichols feature (Working Girl (1988)) provided perhaps the greatest accomplishment of her career: earning her an Oscar, a Golden Globe and a Grammy award for a single song. At the close of the 80s, Simon embarked on a parallel career of writing books for children. The first of these, Amy The Dancing Bear, was published in 1989; four further stories (The Boy Of The Bells, The Fisherman's Song, The Nighttime Chauffeur, and Midnight Farm) materialized in later years. Soundtrack work continued throughout the 1990's, both songs and full scores being contributed to a number of films -- amongst them Mike Nichols' Postcards From The Edge (1990) and Primary Colors (1998), and Nora Ephron's This Is My Life (1992). Her recorded output became somewhat less regular towards the end of the decade, but two more collections of standards, a recording of her 'family opera' Romulus Hunt, and three more albums of original material were issued by the arrival of 2000. Calls herself "one-quarter Jewish." Current Biography Yearbook (1994), page 372. Oscar for Best Music Original Song 1989 for Working Girl "Let the River Run"